It was all delicious. Every last bite. The oysters were perfectly chilled and the accompaniments were flavorful. The hamachi was cut a bit thick for my liking, I'm more of a carpaccio-style curdo gal (How to Cook a Wolf! ), but the basil oil was fantastic. The entrees were pretty amazing. The lentils, chard, and turnips were perfect with the lamb, and I enjoyed more than my fair share even though at sight I thought it was too undercooked..."eat it how it's meant to be eaten." 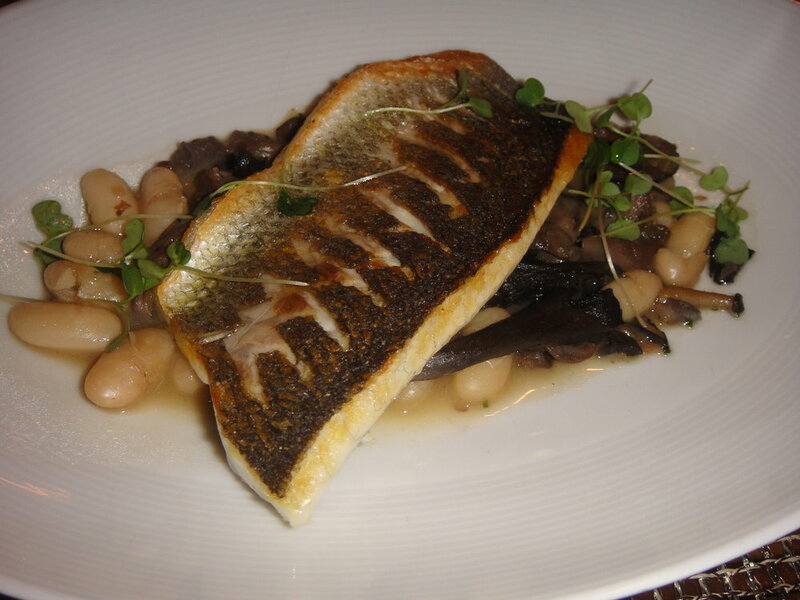 The branzino was superb too, the perfect portion and the beans were marvelously al dente. Dessert was solid, but not that memorable. Our server told us the peanut butter ice cream was "life-changing" but I'm going to call hyperbole on that statement. It was good, but not make-yourself-ill-because-you-ate-it-all good. But it just wouldn't be me if I didn't have some complaints. Like I said, we got off to a bad start. Our server (or the sommelier?) pulled an absurd stunt. I was not impressed. At all. We perused the beer and drink lists but decided we felt like wine, and also thought that would be the most economical option. Drinks were $12 each, but we could get a full bottle of wine for $35. We picked a Willamette Valley pinot blanc that we were sure we'd like. $35. Splendid deal. I have no problem ordering the cheapest bottle of wine on the menu. Too long passed after ordering, and we got to that annoying "where the heck is our wine?" moment. Finally our server came back to report that they were unfortunately out of the wine we ordered but he had a delicious alternative that we would LOVE. He was sure of it. He also slipped in that it was "closer to $50." We not-so-subtly commented that perhaps we'd get it for the $35 price point. No dice. He insisted it was the best wine ever and everyone loves it, and before we knew it he was pouring. At first, I hated it. It was no Willamette pinot blanc. It was French. And SWEET. We drank it in the end, and it grew on me, but then the bill came and it was actually $55. What!? Seriously!? I've never worked in a restaurant, but I just don't get it. We clearly ordered the chepaest bottle of wine on the menu. Why would you give us one that $20 more and think we were going to be pleased? There were several other whites on the list for $35 or $40. It's not like we ordered a $100 bottle and he brought us a $120 bottle. Do I look like that much of a pushover that you can play me? Apparently I am. But I didn't like it. Not one bit. But I did like Mistral Kitchen overall. But it won't be making the "love" category. Not with that ridiculousness.